About Us.pdf To print this page, please download the About Us.pdf file located to the left. If you would like to print all of the pages of this website, find the link at the bottom of the page. ZENGEL & Associates is a commercial real and special use property valuation and consultation firm committed to providing high-quality, expert valuation services to business and professional clients across California and the West. We produce results you can count on. We utilize some of the latest web-based research tools with our extensive, proprietary database to produce outstanding, on-market deliverables. Your appraisal or consultation will be technically accurate and thoroughly prepared. You can rely on our work, backed by our well-earned reputation for unquestionable integrity and independence. We deliver – on time and on price. We know what clients want – a high-quality valuation supported with dependable market data – delivered on time. We offer that, together with a fee structure that satisfies your needs and allows us to complete a first-rate deliverable for you. We don’t promise what we can’t deliver. Many appraisal firms claim to be all things to all clients. We know, because over the years we have “picked up the pieces” for clients dissatisfied with a competitor’s poor-quality product or responsiveness. In contrast, we believe in “no surprises” to you and us. So, we only work your engagement if we can do it accurately and efficiently the first time. And, we keep in touch during your project. In 1982, after professionally appraising for over ten years, A. George (“George”) Zengel, MAI, established ZENGEL & Associates in Fresno, CA. 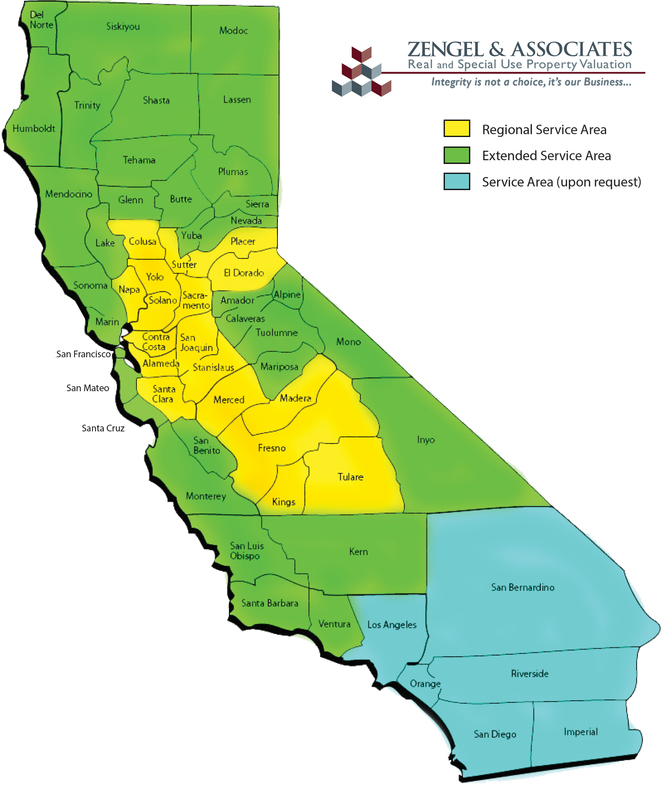 For the next twenty years, we grew a professional clientele in Northern and Central California. Then, to better serve the Gas Station/C-Store sector throughout California and the West, Zengel & Associates acquired the Sacramento appraisal firm of Patrick D. (“Pat”) McIntosh in 2001. This acquisition further expanded appraisal valuation coverage into the Coastal, Central and Northern California service areas that now include over 30 counties and 80 cities/towns. We offer valuation services in four major Focus Areas: Real Property, Special Use, Legal-Related, and Consulting. In today’s business environment of enhanced scrutiny at many levels, it is critical to know that your consultants will provide you with independence, impeccable quality of service, and verifiable results. Rest assured that regardless of location, size and scope, we will complete your engagement with the highest level of integrity and professionalism. Please click on the image to zoom in or to print.